A unique way to cut products with seamless sleeve, called Raglan was coined back in 19 Century England, Since then, the product created in this way have become quite popular. 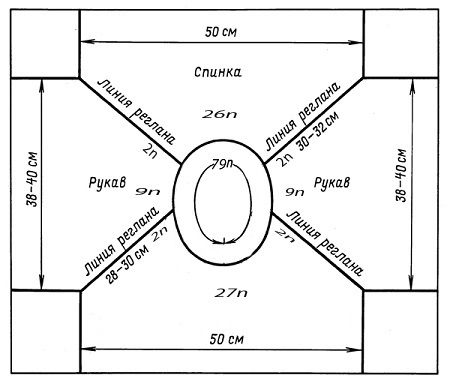 For those, who loves or wants to learn to knit baby veshchichki, It is very useful to know, how to knit raglan spokes, since this is the way to create products allows blouse, platishko and similar products virtually seamless. In addition, and things for adults, associated with raglan sleeves look quite interesting and impressive. Raglan knit spokes can, starting work, as the top product, and below. Let us consider each of the options. In order to link the spokes raglan top, that is, from the mouth of the product must use circular needles. Let us consider the process of this knitting by creating sviterochke. To forehand neckline was lower, than on the back, loop typed as follows: at first 1 loop for a forehand, then for raglan line, for sleeves, to line, to back, to line, for sleeves, 1 loop for a forehand. After that, special pins markers, or by using pieces of filaments, with a color different from the basic product, allocated to each raglan line. The next step is to proceed provyazyvaniya neck, do not forget to add a loop at the beginning and end of the series, necessary for the formation of a forehand products. neck provyazyvaniya continues until, all necessary forehand loops will be added to the web. After that, we throw every piece of knitting needles and knit stocking the product in circles, adding the line raglan one loop. 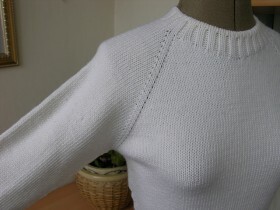 In this way, raglan knitting continues until all the raglan length of lines is below the armpits on the line 5 cm. According to many needlewomen, raglan knit spokes below much easier. In order to create a product with tselnokroynym sleeve likewise, you first need to knit all four parts of, namely two arms, back and bottom up to the size before individually, when the blade does not reach the armhole line. Then each of the parts spreads to hosiery and knitting needles in the correct sequence forming all parts of the product are connected circularly knitting. Loop diminishes uniformly in every part of the beginning of the series after two loops for strips raglan and end of the row before raglan loop line, until, yet does not dovyazhetsya to the neck line. products, associated with raglan sleeves are more free, so this method is more suitable for practical knitting jumpers and free sports dresses and tunics, Well, of course, Clothes for babies and very young children.